I pretty much agree with the previous review. Typical of a mid to late 70's era TV mini-series. The video and audio is of 70's quality, the DVD is without subtitles or closed captioning. The direction is similar to Roots, or The Blue and the Gray type mini series, but Dynasty ends abruptly, without story resolution. Without sequels it makes no sense. This "part 1" develops the characters well, and provides a good foundation for plots, but it leaves you hanging. Like WTF??? Sarah Miles gives an outstanding performance and carries the story, which is why I give it two stars. The other performances are somewhat "choppy" as the other previewer noted. As is... it is quite a mess. What a sad disappointment! :( This movie is a choppy, poorly edited made-for-TV movie with a terrible video and audio transfer, and even more disturbing, it seemed to end abruptly with no resolution to any of the various storylines in the movie. Oh, and just in case you're a Harrison Ford fan, his part in this movie is so small that he is listed in the credits under "supporting players." 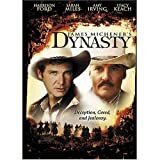 "Dynasty" is *not* a Harrison Ford movie! !